To be healthy, to be whole in body, soul, and spirit, to find strength, courage, and joy in being all we are meant to be. 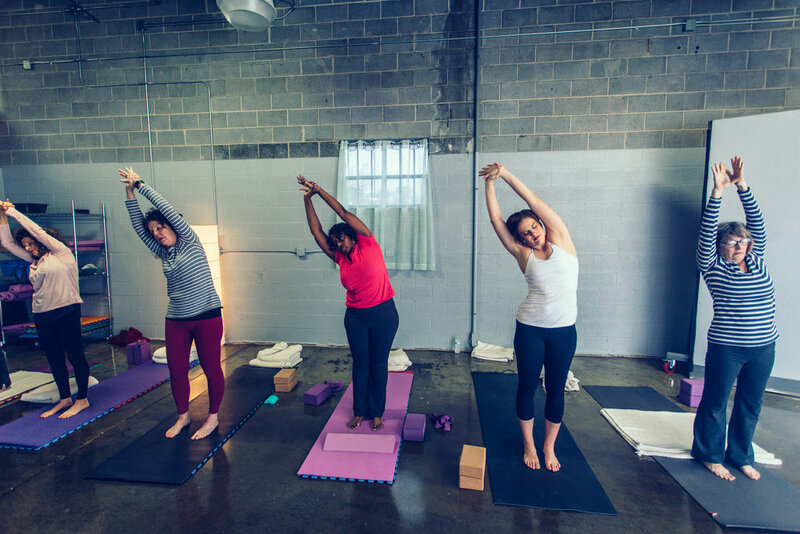 At Yoga Inspired in Columbus, Georgia, we believe yoga is more than a series of poses that bring flexibility and mobility to our muscles and bones. It does that, for sure. But it also gives us the opportunity to use movement to bring our body, mind, and spirit into unity. Movement brings us to stillness, and in that stillness, we listen. We listen to our bodies. We listen to our hearts. We listen to the creative voice of God. Our goal is not to empty our minds, but to fill them with the true words that God speaks to us through his Spirit. We use blocks, blankets, and chairs to safely learn yoga poses. We all have limitations, but we begin where we are and with practice, we develop stability, strength, and endurance. I came to Yoga Inspired after an injury. I had never done yoga, but they made me feel so comfortable. The gentle yoga class has helped me so much physically and also in calming my mind. I’ve been attending class for over a year. I have met so many wonderful ladies and love how Doraine brings scripture into the class. — Francis C.
If you are a postpartum mom and need peace and strength in your chaos come to Jeanetta’s postnatal yoga class. Seriously one class and you’ll be there every Tuesday morning! — Jordan C.
I found Yoga Inspired this year, but feel like I walked into an old family. A lot of people have been together in classes for several years, but are very warm, welcoming, and encouraging. Since attending classes, I have gained strength without strain and balance without feeling threatened by any active position that the class did. Everyone is encouraged to move to the best of their own ability, not an expectation of a perceived perfection. As I have aged, I want to pursue a level of health that will keep me strong and stable for the rest of my life. I believe I have found a method through Doraine and her staff that is sustainable and doable for me and anyone who is willing to “move” their body. I love Christian yoga! — Sista V.
Thank you for your interest in Yoga Inspired. Welcome!